For those whose garages got a little bit fuller during the holiday season with the addition of an off-highway vehicle (OHV) — or veteran riders who frequently hit Arizona’s trails and dirt roads — the Arizona Game and Fish Department encourages everyone to take a riding safety course. Whether riding an all-terrain vehicle, dirt bike or side-by-side, completing a safety course will ensure users have an overview of the basic skills required to safely ride in or operate an OHV. The department’s website links to a number of hands-on courses that are offered by different groups as well as online classes. 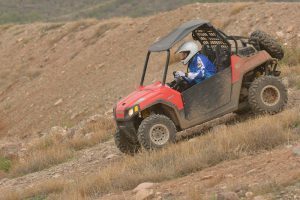 In addition to being a best practice for all OHV enthusiasts, completing a safety course may make participants eligible for a discount on their insurance. A title-only license plate is identified by the letters “RV” and does not allow for travel on roads that require “street legal” registration. A registration license plate is identified by the letters “MC” and is a “street-legal” plate that allows travel on roads, trails and areas on which registration is required. Essentially if the OHV is operating on roads that a passenger car can use, this license plate is needed and the owner will complete a standard registration process. If the OHV is being driven on unimproved roads, trails and areas not suitable for two-wheel-drive vehicles like passenger cars, an OHV Decal must be purchased each year regardless of which type of license plate is assigned to it. If the OHV is operated primarily off-highway, it may be eligible for a reduced vehicle license tax and a waived registration fee — users should purchase the OHV Decal first in order to be eligible for the reduced fee. Once the OHV Decal is obtained, the owner can sign up for an annual email renewal notice to help ensure it stays current. License plates and the OHV Decal are obtained from the Arizona Motor Vehicle Division or authorized third-party providers. Get more information about safety courses and OHV rules and regulations at www.azgfd.gov/OHV.